If you’re curious about what it might be like to experience Peppa Pig Live with your kids, Minimaster has you covered. We got to hang backstage with the cast, crew and producers of the show, and yes — we even met Peppa herself. Turns out she’s even more adorable live and in puppet form! 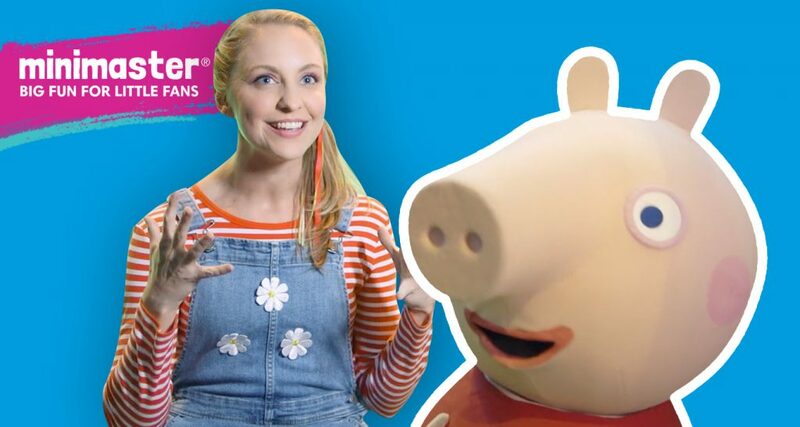 The host and MC of the show, Daisy, gave us an up close and personal look at what goes into to bringing Peppa and her friends to life on the big stage, from what it takes to man the puppets, to who’s behind them. Onstage, Daisy’s your guide through Peppa’s adventures — from jumping in muddy puddles to the school fair — and she bridges the gap between audience and puppets so well that it makes you feel as though you’re a part of the animals’ journey on stage. See the Exclusive Behind-The-Scenes Video Here! Even better, we’ve got a first hand look at what happens onstage in the show, so you can get a taste for what Peppa has in store for her fans in the audience. Take it from me, a mom of two kids who freak out about all things Peppa — the big, boisterous musical and dance numbers gets the audience moving right along with the cast on stage. This is maybe the most important thing to know about this incredible, infectious, and interactive live show — it’s wildly fun for the whole family. In fact, I found myself shrieking in delight and dancing along with my kids the second the giant, round puppets bounced onto the stage, and I didn’t stop until the curtain call. My family was lucky enough to land passes to the VIP after-party, and our video lays out exactly what you can expect if you and your kids hit up the exclusive shindig. 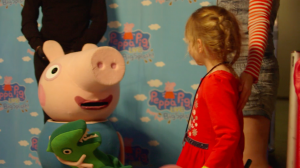 The highlight, of course, is that there is a photo opportunity with Peppa and friends, so you can score that Instagram-worthy shot of your kids freaking out as they meet their favorite pig. (And hey, grown ups fans — you can meet ‘em too!) But there were coloring and craft stations that kept my kids well-entertained, and also sustained the energy and spirit of the show long after it was done. Kate, the Minimaster Mom, lives and works in Southern California with her husband and daughters, ages 6 and 4. They never yell, watch TV, or eat sugar.